Carnival or Mardi Gras – the fifth season has many names. Carnival parades are always an exiting event; however, in most western cities it is too cold to enjoy the spectacle to the fullest. Fortunately, carnival is celebrated in many other countries, where one can let his creativity run wild in the costume design and have fun. Sure, when thinking of carnival in the sun, Rio de Janeiro comes immediately to mind. The most famous street fair in the world attracts thousands of people every year and from around the globe. There one can make new friends and dance to the rhythm of Samba music all night long. 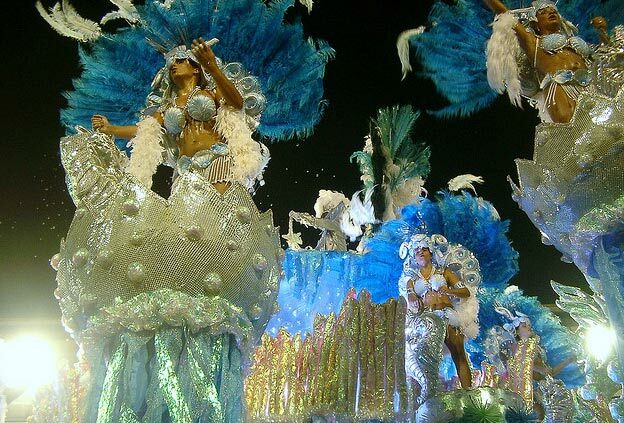 For those who prefer it a little less Samba-oriented, there is the option to take part at the carnival parades in Salvador da Bahia. This town lies a couple of miles outside of Rio de Janeiro and organizes the world’s largest street carnival, according to the Guinness Book of World Records. The parade route is just under 17 miles; the music ranges from Samba to Reggae to African drum rhythms, and the theme is “celebration”. Mardi Gras is a reminder from the French colonial period and inextricably links with the city on the Mississippi. The “Fat Tuesday” is the culmination of nine parades of Carnival in New Orleans. The festivities officially begin on January 6th; however, most parties and parades take place the last five days before the start of Lent. In the French Quarter, especially on Bourbon Street, on can marvel at imaginative guises. Everywhere one will encounter the Mardi Gras colours purple, green and gold. These are on the beads that are thrown from floats, as well as on the glaze of the King Cake, which is traditionally served at Mardi Gras. In Spain, carnival is a striking event, too, for in Fuerteventura, Gran Canaria, Lanzarote and Tenerife the festival is celebrated extensively. The Carnival in Santa Cruz de Tenerife is known as the European equivalent to the Carnival in Rio, even in its terms and size. This is an ideal location to go for those who want to party the Brazilian style but shy away from the long journey. The three-week festivities reach its peak on the Tuesday before the Lent. On the last evening, a gigantic paper-mache sardine is carried through Santa Cruz and its neighbouring towns, and finally burned to signify the end of the carnival season. Sergio writes about travel destinations and reviews various types of accommodation in the UK and around the world. I can’t advise enough about the Tenerife Carnival. Everybody should go there at least once. Great fun in the other traditional villages in Tenerife also. I still haven’t made it to Mardi Gras yet though!